Cause du décès: Training Accident at Dartmouth N.S. Educated at the Kennedy Collegiate and Cass Technical School, Detroit, Michigan, USA. He was an expert in Radio technique, first as a hobby and then as a business. After enl. 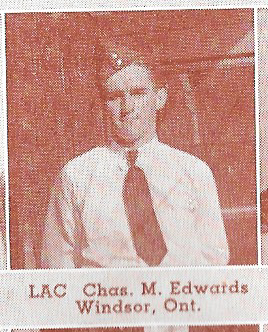 in May 1940 trained at Montreal, Moncton, Halifax and Dartmouth. Surv. Father, Charles Edwards of Windsor, Ont., sister, Mrs. JD Roadhouse of Leamington, Ont. Aucun article sur Leading Aircraftman EDWARDS n'a été trouvé dans les médias. Aucun document additionnel sur Leading Aircraftman EDWARDS n'a été trouvé.